The best way to handle pressure is to establish a preputt routine and never deviate from it. It should be automatic, freeing your mind so you can focus on the task at hand. There is nothing on how to play golf that has not already been thought of, written down, or spoken about by someone, somewhere. This is not surprising as golf has a long history. Technology and techniques may change, but the objective of the game remains unchanged - Get the ball into the hole in the least number of shots. Learning from others is about Finding, Sorting, Refining, and then Condensing Information - information that can be contradictory, complicated, and confusing - into simple key elements that you can use to improve your performance. The first skill to learn in putting is how to putt the ball straight. The purpose of this web site is to show you that the way you putt is not the only possible one. There are those who believe that, as putting is such a simple skill, there is no need to bother with the technical side of it. The reason they give is that putting is something that comes naturally and should be done without conscious thought. It is true that you should be free of any thought when you putt. However to get to this point of freedom, I believe you must first experience conscious understanding of what it is you are trying to do. Before you start into the Instructional pages, please read the page on Using Web Site as it will help you to put the Instruction into context. I learned my golf through trial and error. My biggest regret is that I didn’t have good information when I played competitively. That is the trouble with good information - it usually comes too late for you to enjoy its full benefits. If I had my chance again, I would do it all differently. My first priority would be to learn how to putt consistently. There are many instructional books and videos offering advice on every aspect of the short game. 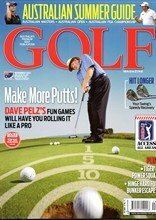 Each month a new issue of golf magazines adds to the ideas, opinions, and expert tips. Our very nature makes us hungry for easy solutions. Are you too attracted to the quick fix? The bad news is that for every tip, idea, suggestion there is another giving you an opposite view. It all adds to the mumbo jumbo of instruction. The SIMPLEST way to do something is usually the BEST way to do it. The fewer moving parts … the less need for compensatory adjustments … the more consistency. This applies to everything you do from tee to green. This web site is arranged to give you BASIC INSTRUCTION in an EASY-TO-FOLLOW way so you can decide on the method that is best for you. It is not only my observations, but an amalgam of the information that I have researched over the years from many sources. I will identify the source whenever possible. If I don't acknowledge something, it is because I have forgotten where I read or copied it. I do not wish to infringe on anyone's copyright. If you have found anything that infringes on your rights, please contact me immediately. From time to time I will be offering you a number of recommendations based on my research and personal experience. If you check the A to Z Index you will find additional information on the topics listed in the navigation bar. Alternatively go to Site Search in the NavBar or the Top Header and type in a key word e.g.putting grip. Get reading, and by practising the ideas of PUTTING MADE EASY, you will soon enjoy the satisfaction of being known among your friends as a good putter. This web site is referenced to right-handed players. If you play golf or putt left-handed, please reverse all references to the opposite side.